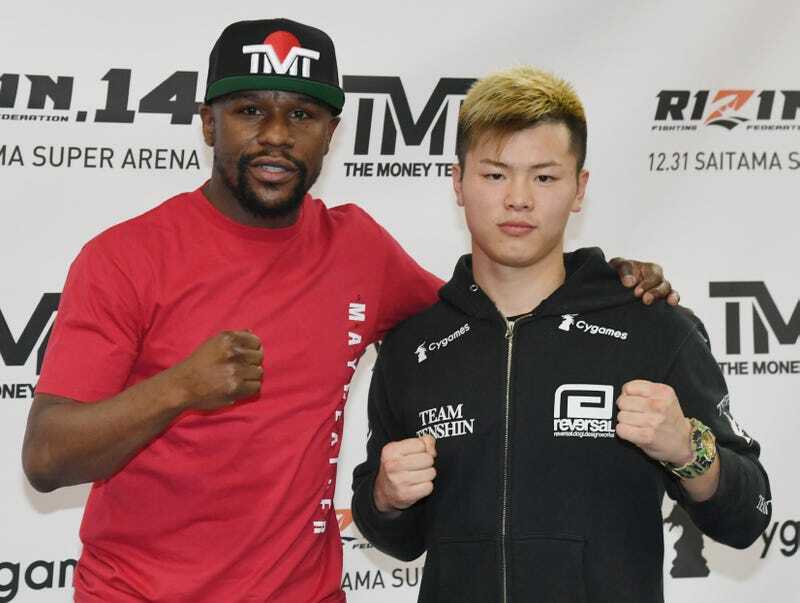 Filed to: Floyd Mayweather Jr.Filed to: Floyd Mayweather Jr.
Floyd Mayweather Jr. (L) and Tenshin Nasukawa pose during a news conference at the Mayweather Boxing Club on December 6, 2018 in Las Vegas, Nevada. The two will meet in a three-round boxing exhibition at Saitama Prefecture Super Arena in Saitama, Japan on December 31, 2018. Floyd Mayweather Jr. is becoming a worldwide carnival act. In the latest attempt at “come beat the champion,” Mayweather took his talents over to Japan, where he beat the brakes off of some guy named Tenshin Nasukawa. In what was billed as an exhibition fight, Nasukawa and Mayweather ... hell, I don’t even know what to call it as they didn’t really fight. I mean the other guy was fighting but Mayweather was in the ring in full black and face paint because even he knew this was a robbery. This foolishness didn’t even last a round. In fact, if you didn’t know it was happening, you wouldn’t be alone as Mayweather, who will usually talk about anything, barely mentioned it was happening. Mayweather basically went to Japan for what was supposed to be a three-round nine-minute boxing show and walked away with a cool $9 million dollars for less than a round of work. First, I’m unsure why fighters who aren’t boxers keep thinking they can beat arguably the best living boxer. Nasukawa is a kickboxer according to his Wikipedia page, and I guess he’d thought it’d be fun to get beat up in front of a crowd by the best boxer walking while limiting himself to only using two of his weapons and half of his arsenal. Secondly, Mayweather didn’t even attempt to make this fight as entertaining as the Connor McGregor fight. Maybe he did and just didn’t expect Nasukawa to fall so quickly, but Mayweather just got paid a cool $9 million for 139 seconds of work with a kickboxer who couldn’t hang with some of the fighters that train at Mayweather’s gym. Sounds like someone got robbed. You can watch the entire fight here. Don’t worry, the introductions of the fighters lasted way longer than the actual fight.